World 4 is the fourth world of Super Mario Run. Although its exact terrain is unknown, it contains four levels that consist of the fortress, grassland, underground, and airship themes, respectively. This world is available after completion of World 3, and unlocks World 5 upon its own completion. 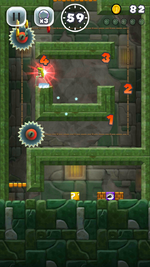 World 4-1 Cutting-Edge Spire A fortress level with Grinders. 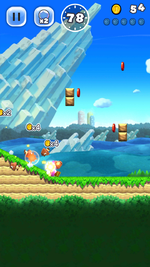 World 4-2 Slope to Success A grassland level with slopes, Goombas, and Koopa Troopas. 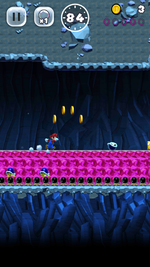 World 4-3 Danger High and Low An underground level with Buzzy Beetles and Munchers. 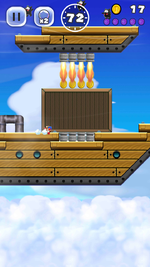 World 4-4 Firing the Airship's Burners An airship level containing Burners and Ninjis, as well as the game's fourth boss battle, against Boom Boom. This page was last edited on August 31, 2018, at 23:01.